SANGUEM: Chief Minister Pramod Sawant claimed to be fully aware of the problems faced by the people living in Sanguem particularly by the mining dependents due to the closure of miming activities and the agriculturists due to inadequate supply of agricultural water. All the problems faced by the people will be solved in the near future, claimed Sawant while also assuring the resumption of the mining activities very soon. Sawant urged the people to vote for BJP and ensure the victory of BJP at the centre. During the last five years of Modi Government, Goa has achieved tremendous development in all sectors and this was feasible only because of ardent efforts of our late Chief Minister Manohar Parrikar, claimed Sawant. 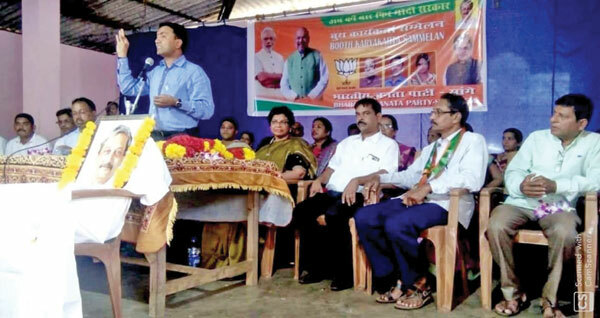 Sawant was speaking at the BJP karyakarta meeting held at Wadem Colony No. 2 in Sanguem in the presence of Power Minister Nilesh Cabral, Ex MLA Ssnguem Subhash Phaldessai, Adv Narendra Sawaikar and others. Speaking further, Pramod Sawant said that the current government is a continuation of the Manohar Parrikar-led coalition government. The first two years were ruled by Manohar Parrikar and the next three years will see the same level of development which Manohar Parrikar had visualized for Goa. Sawant urged the party workers to work for the party candidate Narendra Sawaikar and secure his win in the South Goa Parliamentary election by securing maximum votes in Sanguem constituency. Taking a dig at the functioning of MGP, Sawant claimed the party leaders to be using the Party for their selfish gains rather than working on the ideology for which it was formed by Bandodkar. “Bandodkar must be crying up there looking at the affairs of MGP. We didn’t break the coalition, they did not abide by coalition dharma. They were not interested in Goa’s interest, they were interested for their selfish gains,” he added. Adv Narendra Sawant in his address to the gathering urged the workers to work with the same zeal for the party as they have been working all these years. Sawaikar appealed the party workers to support the BJP government and give the Modi led government the second term. Power Minister Nilesh Cabral and Ex MLA Subhash Phaldessai also spoke on the occasion.